Think of an animal that starts with K. Now think of a continent. Did you think of Australia? Why? Is it because I have eerie powers and I can read your mind? Possibly, if you’re a weak-minded fool and are susceptible to old Jedi mind tricks. But for the rest of you, if you were just asked to think of a continent out of the blue, would you automatically think of Australia? Probably not. But the previous question gets your mind thinking Down Under (since most people think of kangaroos or koalas), and your mind (at least most people’s minds) will keep going down the same path. That’s how our minds work; we get an initial starting point, and everything that comes after reflects it. Have you ever thought about the way Paul opens his letters? They almost all start with Paul identifying himself, as well as the church/person he is writing to. But he doesn’t just say, “hey Goobadiah, it’s me Paul.” In the case of the Ephesians in our chapter today, he opens by saying “Paul, an apostle of Christ Jesus by the will of God.” Notice how Paul sets the initial frame – what he is doing with his life at that moment is not just his decision; it is by the will of God. Everything that he writes in the letter after that is framed by that knowledge and self-identity. That is his basis for viewing the world. If you wrote a letter, would you be comfortable say that what you are doing now is by the will of God? Are you confident you are where God wants you to be? Are you “Dave, a plumber by the will of God.” Or “Denise – a lawyer by the will of God.” Or “Francis – changing poopy diapers by the will of God.” If you saw everything in your life as doing it for God and by His will, how would your attitude or actions change? Do you think that might affect the way you view your job, or education, or ministry? When you think of yourself, or when people ask you one thing about yourself at those ice-breakers that we all love so much, does your identity in Christ come to your mind first? If someone were to ask you to write a brief paragraph about you, what is the first thing you would say? Would it be “parent,” or “doctor,” or “unicycler”? Or do you know that you are Christ’s first and foremost? Our first identity, before the job title, before the spouse, before the family name – our very core identity needs to be rooted in Christ. If (and probably when) most of those other things disappear or fade, we are still His; we still remain who we are, because He remains who He is. Forever, unchanging, unwavering, unquestionably the same Jesus you met that first time. No matter what you do, or where you go, or who you’re with, Jesus is still the one by whom and through whom we all have our being. Sometimes the ol’ English language is a little tricky for the Believer. 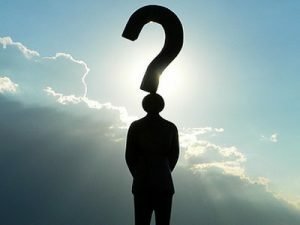 Words have more than one meaning, or we use more than one word to say the same thing Which means we have words that can carry a negative connotation in one sense, and so we are hesitant to use it in its proper or positive way. Confused? Let’s take the word “guilt” for example. Most of us would agree that Christ’s sacrifice on the cross atones for our guilt, in the sense that He took the punishment for our sin upon himself. In that way, we no longer have to “feel guilty” in the sense that God has forgiven us. 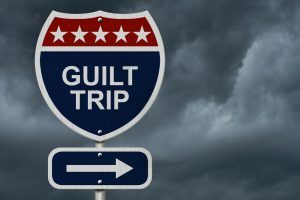 On the other hand, guilt can also mean “the feeling that you aren’t doing enough,” and that can be either good or bad. But because we know we shouldn’t feel “guilt version 1,” we automatically think that “guilt version 2” is also a bad thing. And so guilt gets a bad name; it’s seen as manipulative, or self-serving, or even dishonest. We have whole seminars built around getting rid of our guilt feelings. We may even get mad at our pastors when they try to push us into giving extra to the building fund or missions budget. How dare they guilt us into serving God? – They “gave to the Lord” and also to other believers. Then Paul basically starts schmoozing – “you’re so good at everything, why not be good at giving too?” It’s like when the coach points out Rodney making all his shots, and tells you that could do that too, if you worked a little harder. The hard part to accept is that we often like to blame leadership for “guilting” us, when in reality they are simply challenging us to do what we should be doing with a cheerful heart. We blame them for “manipulating,” instead of looking in the mirror and see if perhaps they’re not the ones gaming the system. We want to be able to do what we want, and not be forced to feel bad about it. Maybe if we feel guilty, or we get upset at people “guilting” us into giving, maybe instead of blaming them, we need to look at own hearts. If somebody tells you “you’re not eating enough pizza,” you probably don’t get mad or think they’re guilting you. You’re excited, because you’re looking to get going on correcting that. Shouldn’t our attitude be the same when it comes to giving? If a pastor/missionary challenges us to give, shouldn’t we be as excited to join that ministry as we are to ingest melted cheese? Guilt in that sense can be a good thing, because it can motivate us to pursue a more holy life, in our giving, or thoughts, or actions, even if we don’t liek someone pointing it out. Maybe others guilting us isn’t the real problem. Maybe the real problem is we have something to feel guilty about.